What’s the return on that investment? Note: This is my fourth in a series of blog posts on Vancity’s social media journey over the last five years. Both Ron Shevlin and The Financial Brand have written very good posts recently on the topic of social media ROI, so I thought I’d join in. I find it interesting and troubling that so much of the focus on social media has been on ROI. I am starting to think that this whole discussion thread is very close to pointless. Some people have successfully measured the ROI of social media and proven its value. Great. And there are some case studies, especially for larger companies with expensive and complex customer service channels, where the ROI is pretty good. But for the rest of us, honestly, it’s a stretch at best. Truthfully, even if you do measure the ROI of social media, it likely pales in comparison with the ROI of other digital tactics such as email, multivariate testing, usability enhancements or search engine marketing. In most cases, social media is a bad bet from a purely ROI perspective. More relevant is the fact that most organizations aren’t sophisticated enough to measure the ROI of it anyway. I believe that the reason many companies have gotten involved with social media is that some people in Marketing and Communications departments personally like Facebook and Twitter and then introduce these tools into their organizations. If the culture of the organization isn’t permissive, progressive or ready, that can be an abdication of professional responsibility – to put one’s own preferences and proclivities ahead of the needs and abilities of the company who hired them. The other danger with this approach is that it starts from the middle. Social media is the kind of activity that the whole organization needs to get behind. If a handful of people in Marketing or Communications “own” it, and the C-suite isn’t behind it (or aware of it), it’s going nowhere fast. As an aside, my take on ROI for successful business casing is that there needs to be a definable and beneficial financial return balanced with a strong alignment with the mission, vision and values of the organization. In other words, it’s usually about hearts and minds. Rarely can a business case achieve a perfect balance of both, and when it can it’s an amazing opportunity. When it comes to proving the value of social media, it’s about furthering the organization’s vision and brand, more than the financial return. So if you’re sick of the same old Comcast and Best Buy case studies trying to rationalize social media, you’re not alone. Instead, connect your social media strategy inextricably to the ways you already engage community. My advice is: don’t get caught in the ROI trap. Align strategically with areas where your organization currently engages its customers, members or stakeholders – make a real link with the mission of the organization. If you have to prove true ROI, if your organization requires it for everything you do, change focus to email marketing or some other digital marketing tactic and please the organization that way. Otherwise, I would suggest that you’re not being true to the nature and culture of your organization and therefore can’t authentically leverage social media anyway. Or you’re simply at the wrong organization and need to be at a company where you can do what you think is right, while also doing what is right for the company that hired you and signs your paycheques. 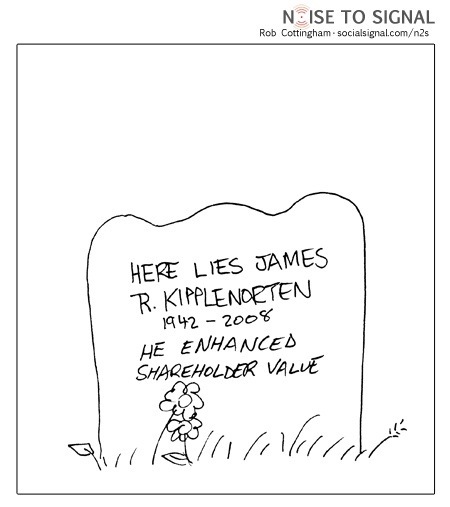 Again, thanks to Rob Cottingham for letting me use his Noise to Signal cartoons in my post. Visiting a Glaswegian credit union. I think you’re dead on to compare social media investment to other initiatives that have a soft ROI. Isn’t almost all of marketing (where social media tends to get put for most companies) in that category, anyway? I mean, what is the ROI of a typical advertising campaign? To answer my own question, bearing in mind that I know nothing about advertising, I expect that there are accepted norms for ROI on advertising: put a billboard in front of X eyeballs of Q quality or relevance, and the payback is Y; otherwise, why would anyone put money into advertising? The benefit of social media is, like web advertising, you know X and Q. The challenge that social media proponents need to respond to is what is Y? Hi Rene. Thanks for the comment. Right, take a look at this brilliant post (http://www.randomactsofdata.com/random-metric-names-and-symbols-is-not-an-equation/). An hysterical example of people trying to figure out crazy ROI schemes. There are cases where it can reduce customer service costs and increase efficiency, but only for very large organizations. 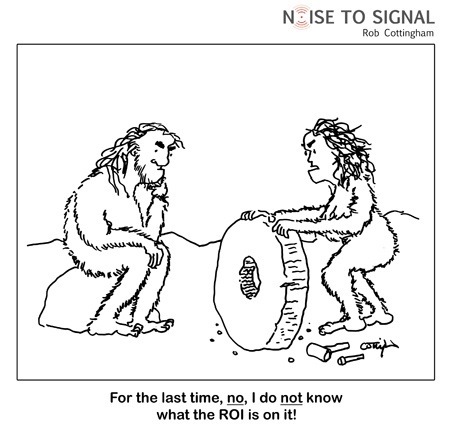 Here’s a pet peeve: people who take a perfectly good acronym like “ROI” which everyone in the organization from the janitor to the CEO understands to mean “Return on Investment” and change it to something else that is meaningless. That number has no choice but to escape into the wider world and get interpreted as actual return on investment and sow confusion everywhere it goes.